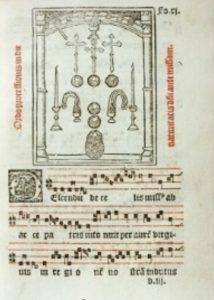 Home »Announcements»Gregorian Chant Workshop – Book Now! Part of this year’s Poetry Festival, SING GREGORIAN CHANT on 3rd July is a chance to experience Gregorian chant in a friendly context. The aim is to be an entertaining, friendly, informative and enjoyable experience. Booking for this event is now open in advance of the main Festival Booking period and numbers are limited so book now! We are using a new booking system for 2018 so the booking process is different but, we hope, self-explanatory. As we have experienced problems with people using PayPal in previous years, we have changed to Stripe to handle card payments. We have also removed the requirement to create an account and logon to book tickets as we have found that people lose passwords from one year to the next causing numerous issues. We will still require your name and contact details however. To find out more about this event and to book tickets go to the Gregorian Chant Workshop event page.